﻿﻿She's back! Feral Cheryl was created almost 20 years ago as a tongue-in-cheek response to to the Barbie doll. 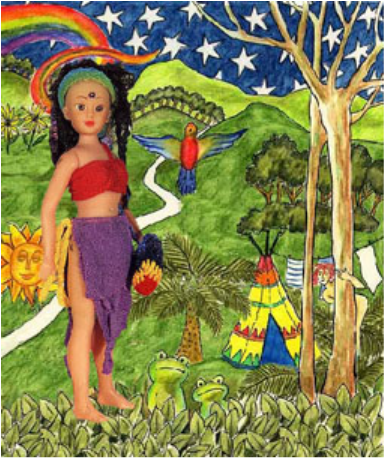 With dreadlocks, tattoos, piercings, bare feet and a bag of herbs, Feral Cheryl attracted international attention as a simply-living eco-feminist anti-Barbie from the New South Wales North Coast. Tattoos and piercings are far from unusual now, but nature girl Feral Cheryl remains the only doll with a map of Tassie. Feral Cheryl has no fashion wardrobe, no sports car or beauty salon, no mansion or boutique. Feral Cheryl was modelled on the environmental activists, eco-warriors and hippies of the 1990s in Australia,, nicknamed ﻿'ferals'. Feral Cheryl is not the product of cheap offshore sweatshop labour. The doll body has been custom made at a family-run doll factory in South Australia and the features finished by hand by creator Lee Duncan. All are individually finished and no two are the same. Her only accessory is a hand made bag of herbs, and a sense of humour.